PHS Research Fellow Youngeun Koo in the Reading Room, 2018. Since 2017, I’ve gathered archival and oral data from Korea, Sweden, and Denmark. The United States was my last stop for data collection. I was very fortunate to receive a Research Fellowship from PHS, which significantly helped my six-week stay in the United States. 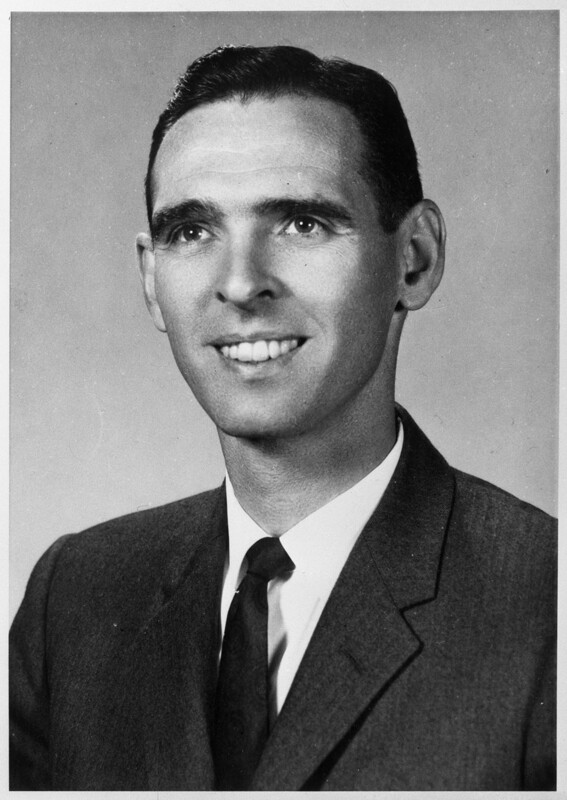 In this blog post, I’ll talk about the ECLAIR project, initiated by Presbyterian missionary George P. Whitener in 1964 and later handed over to a Korean adoption agency, which drew me to PHS in the first place. ECLAIR brochure, 1965. Photo courtesy of Youngeun Koo. After the Korean War, the number of mixed race children--born mostly between Korean women and American soldiers--increased in South Korea and was considered a major social issue; honhyŏra munje literally means "the mixed race children issue." The South Korean government under the administration of President Syngman Rhee strongly pursued overseas adoptions of these children to the United States. Previous studies on Korean adoption invaluably reveal both institutional and individual efforts in this large-scale movement of children. Since the majority of these studies focus on the adoption issue in the second half of the 1950s, some readers might conclude that the "issue" of mixed race children was somehow "solved" through intercountry adoption by the early 1960s. This impression is far from true. Both official and unofficial statistics show that the number of mixed race children in Korea continuously grew in the following decades. During the 1960s and 1970s, it is estimated that there were between 1,000 and 3,000 children of mixed parentage in any given time. The children might have become less visible in Korean society after 1960 due to the separation and containment of camptowns from the majority of Korea. However, both institutional and everyday discriminations against mixed race children persisted and it became a growing concern for foreign aid and missionary workers in Korea that many of the children were reaching adulthood without adequate education and training. 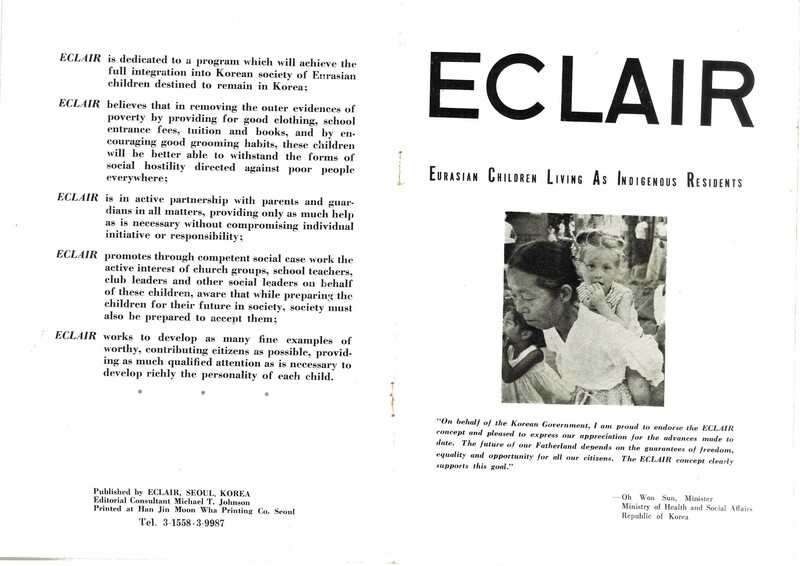 One of the first projects to address this issue was ECLAIR (Eurasian Children Living As Indigenous Residents), launched in 1964 by Mr. Whitener, a missionary of the United Presbyterian Church in the U.S.A. The program was aimed at providing educational and vocational training opportunities for young people of mixed parentage so they could establish their lives in Korea. The materials at PHS reveal several difficulties that the ECLAIR project faced: from negotiating with Korean schools to accept mixed race children to securing funding and transferring leadership to the local agency. I believe that projects like ECLAIR powerfully demonstrate that the "problem" of mixed race children was not "solved" through overseas adoption. Instead, that practice might have contributed to the marginalization of mixed race children in Korean society due to the lack of domestic support and recognition. An interesting and rather unexpected insight I gained during my visit to PHS was that, while foreign aid groups worked closely together, there was also competition among them to be recognized as the primary supporter of mixed race children. The strong emotional resonance that the fortune of mixed race children invoked in American (and other Western) fieldworkers and donors might partly explain this rivalry. As I continue my research, the materials that I gathered at PHS will help me to better understand the impact of foreign and local groups’ activities on the development of Korean child welfare and to draw a more vivid picture of difficulties experienced by mixed race children themselves. My experience at PHS was very special. The staff greatly helped me--both before and during my visit--to find all relevant materials and to best utilize the limited time I had there. Prior to my visit, PHS reference archivists contacted me whenever they came across unprocessed materials that might be useful for my research. I was deeply impressed by their knowledge of and passion for PHS's collections. I’m extremely grateful for their support and for my fellowship, and I look forward to revisiting PHS in the near future! Youngeun Koo is a PhD candidate in Korean Studies at the University of Tübingen. She holds an MSc in Migration Studies from the University of Oxford and a BA in History Education from Korea University. Her research interests include intercountry adoption, needy children, and family; welfare and the state; and mobility, migration, and transnationalism.